When will the carry-on madness end! Air travel continues to be a painful love affair. How else can I get from Ottawa to Arusha in a reasonable amount of time if not by flight? Weight and baggage size restrictions, additional laptop check, shoe check, endless amount of security agents all seemingly scanning my boarding pass every 5 minutes... the list goes on and on, and it keeps growing. Now Virgin Atlantic has upped the ante and is implementing even more draconian and restrictive policies. What's next I dare ask, what will they do next!? 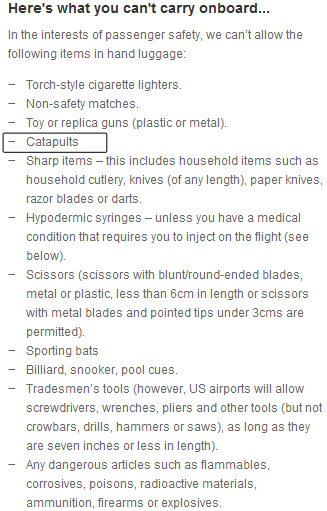 I, as a paying customer, should be allowed to bring a catapult onboard with me if I want to. How else am I supposed to let the flight attendants know that I need a refill?